A moderate economic rebound is expected in 2016 and 2017, given that the domestic security situation will not again hurt tourism and business sentiment. In Tunisia, the October 2014 parliamentary and presidential elections were peaceful. A four-party coalition is ruling the country since the beginning of 2015. However, this broad coalition government is prone to tensions and difficult decision making as it consists of both secular and (moderate) Islamist parties. The internal security situation remains tense and the risk of additional terrorist attacks after several assaults in 2015 remains high. It is estimated that some 3,000 Tunisians have fought or are still fighting for IS in Syria and Libya, and some of them returned home, posing a high security risk. Tunisia remains negatively affected by the on-going civil strife in neighbouring Libya. The new government faces enormous challenges in improving social and economic conditions, as unemployment is still very high and a failure to improve general living standards could create social unrest. In 2015, GDP growth slowed down to 0.8% as the fragile security situation affected the business environment and hurt the economy. Especially the tourism sector was hit by terrorist attacks last year. 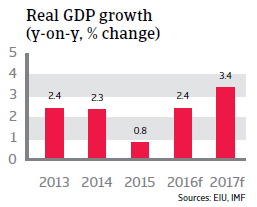 In 2016 GDP is expected to grow 2.4%, however this rebound is heavily dependent on the security situation, as any further deterioration could again severely hurt domestic demand (private consumption and investments) and tourism. Government spending, especially in undeveloped regions, will contribute positively to growth. The budget deficit is large (4.4% of GDP in 2015) due to increased social spending and investments. 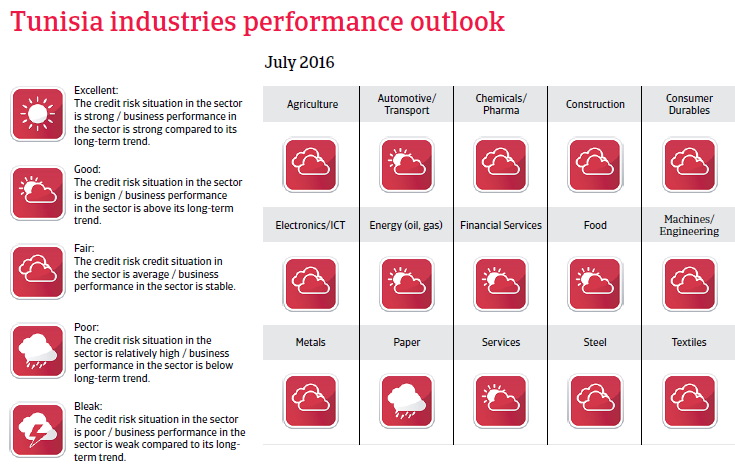 However, it is expected that lower oil and food prices will relieve government finances in 2016 and 2017. 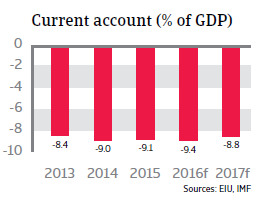 At the same time, the current account deficit is high (more than 9% of GDP in 2015 and 2016), due to fewer exports, lower remittances (many Tunisians worked in Libya) and decreased tourism revenues. 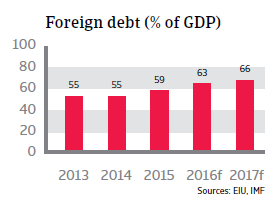 In order to finance the twin deficits, external borrowing has increased, resulting in high external debt (59% of GDP in 2015). Foreign exchange reserves are still sufficient in terms of import cover in months, as imports have decreased due to weak domestic demand. However, short-term debt in relation to international reserves remains high in 2016, at 95%. 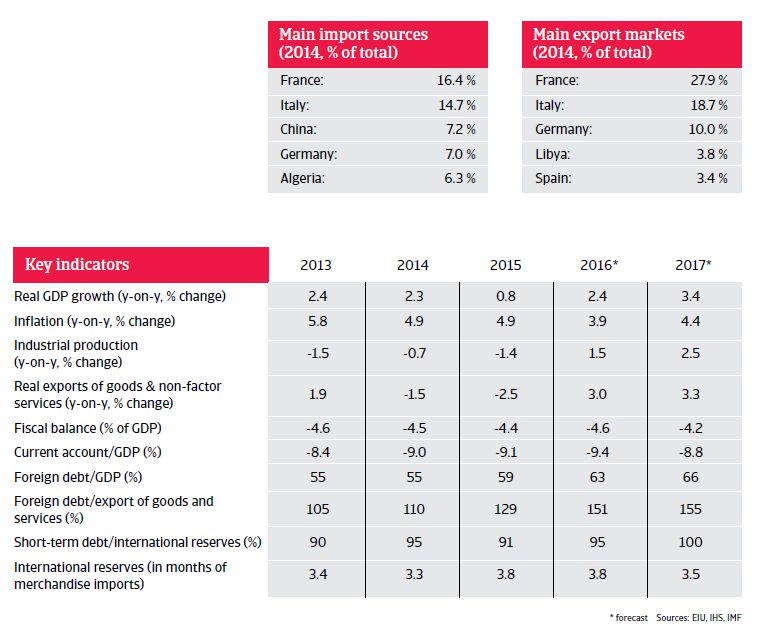 Foreign reserves are not covering Tunisia´s high external financing requirement, and the country will remain dependent on multilateral and bilateral support. It receives major financial assistance from the IMF, World Bank, European countries and the US. It is expected that this support will continue, as international donors want to bolster the on-going transition process towards a stable democratic system. However, in order to keep external debt sustainable in the long-term the government has to reduce the budget deficit and introduce reforms to accelerate economic growth.